Spray foam is used in ceiling and wall cavities for insulation and air sealing. After it is sprayed in cavities, it expands to fill all nooks and crannies. Excess foam is then scraped off for a more uniform wall cavity. Spray form is perfect for insulating steel framing and surround outlets because this type of insulation expands into tight areas. It acts as barrier to wind and air, eliminating the need for separate air-tightness detailing. 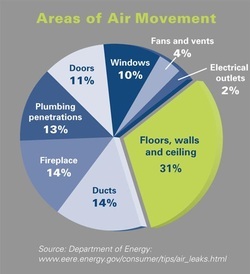 This process will help increase your space’s energy efficiency, while also helping downsize your heating and cooling equipment. This type of insulation does not settle, biodegrade, sag or even shrink. Spray Foam's pour fill variation is an insulation and air barrier that injects the latest building technology into an older building to maximize energy efficiency while still preserving its original architectural details. Spray Foam Insulation fills the wall cavity completely, starting at the bottom and slowly expanding upwards to 60 times its initial volume. Since Spray Foam expands in the direction of least resistance, it will not expand outward and damage the wall. Cellulose insulation is made primarily from recycled paper. About 75 percent of the material used to make cellulose insulation is post-consumer waste paper. Cellulose insulation is blown into wall and ceiling cavities as well as onto attic surfaces, though to stick to attic ceilings it must be held in by netting or sprayed on wet with an acrylic binder to prevent settling. Like all sprayed or blown insulations, it can be installed into wall cavities through a series of small holes in the wall, causing little disturbance during remodeling. It is not suitable for application below grade (below or at the perimeter of the foundation) or in other locations where it would be exposed to moisture. Installed in residential and commercial buildings to reduce Summer heat gain and Winter heat loss, a Radiant Barrier is a thin sheet of reflective material installed on one or two sides of the structure. The Radiant Barrier helps reduce the air temperature of the attic – or adjoining room – by preventing radiant heat from transferring in or out of the space. Because some ducts are concealed in walls and between floors, repairing them can be difficult. However, exposed ducts in attics, basements, crawlspaces, and garages can be repaired by sealing the leaks with duct sealant. In addition, insulating ducts that run through spaces that get hot in summer or cold in winter (like attics, garages, or crawlspaces) can save significant energy. Why R-Value alone is not the answer! R-Value is a measure of resistance to heat flow, but it only measures resistance to conduction. Conduction is the transfer of heat within an object or between two objects in contact and is only responsible for 20% of a building's heat loss. Convective heat transfer occurs when air moves within the walls. Natural convection currents occur when temperature difference in different locations create air movement which transfers heat. Conventional fiber insulations resist heat loss by conduction. The air is free to move within and through the insulation, Which decreases the insulation value and can lead to damaging moisture problems.